Hiking and backpacking are some of the most popular outdoor activities, but you should always plan ahead before heading out for an entire day’s journey or a multi-day hike. Preparing for the outdoors involves more than simply packing the right clothing and gear. As we all know, the food we eat provides the energy we need to climb mountains, discover new trails, or find our way out of a dangerous situation. Calories are units of energy that our bodies require to function. When considering how to best fuel for a hike, it’s important to remember the best hiking snacks. Your body will continuously need protein, carbohydrates, and fats to hike safely and keep you moving with optimum energy. Join us as we explore delicious and nutritious snacks that will keep you healthy and ready to take on any adventure. With our help, you can better prepare for your journeys on the trail and lend a tip or two to your climbing companions. Once you’re certain where your upcoming adventure will take you, the key to performing at your best level is packing the perfect amount of food to sustain your energy needs without weighing down the rest of your pack. Most hikers don’t intend on losing weight, so it’s essential that you consume as many calories as you lose. Although each hike is very different, we can safely assume that the average hiker loses between 3,000 and 3,500 calories per day as he or she gradually ascends and descends various terrain. In addition to three large, healthy meals, you need to pack enough snacks to sustain your required energy levels. We’ve discovered several methods for determining how much food to pack. Deciding how much food to pack varies from person to person. Medium to large males may need to consume up to 4,000 calories per day, equaling to approximately two pounds of food per day. A woman of less weight may only need to consume between 2,500 and 3,000 calories per day, equaling to approximately 1.5 pounds or less per day. Because these are averages, it’s important to note that your body’s calorie requirements may be very different. Intense training for an extreme hike may give you a much better idea of what your body requires to feel good and healthy throughout the strain of constant exercise. Shorter hikes require a lot less snack and meal planning, but you must still make the proper accommodations to maintain your energy, especially if you’re a trail running enthusiast or fast-speed hiker. For thru-hiking and distance backpacking, we suggest mapping out your eating schedule well in advance. You can get away with packing canned foods or vacuum-sealed pouches for shorter hiked because avoid adding unnecessary bulk for long-distance excursions. What’s a foolproof way to plan ahead for your upcoming adventure? Simply calculate the calorie-to-ounce ratio for each homemade or prepared food you plan to pack. This is a simple solution for determining your food needs based on caloric requirements without going overboard. When in doubt, remember to pack foods that you’re already accustomed to eating. The last surprises you need while exploring the wilderness are an upset stomach or adverse reaction to foreign snacks when you’re far away from medical attention or a proper restroom facility. Also, remember to be safe rather than sorry. We suggest packing some extra snacks rather than meals to err on the side of caution and preparedness. Snacks can be calorie dense and nutritious while packing down to considerably smaller sizes than full-fledged meals. The human body can go up to three weeks without food but definitely not without water. Some rigorous hiking programs are designed with the prerequisite of food-less days to conserve on pack weight so they can achieve optimum speeds while traversing. We briefly touched on the significance of protein, carbohydrates, and fats, but it’s important to know why each caloric source is essential to optimal performance on the mountain or the trail. Our hair and nails are made of it, and our bodies utilize protein to build or repair tissue. Although we often hear that one can never go wrong with protein, our bodies do not store it. It’s important to consume a modest amount of protein so your body can function while reaching high altitudes or bushwhacking through unchartered territory. Remember that much of the protein we consume throughout our daily routines includes a lot of trans fat, sodium, and other unhealthy components. Skip the juicy steak and focus on alternative sources of protein to keep your body happy, healthy, and functioning. Although dieticians and celebrity trainers have conditioned us to fear carbs over the last few decades, there is a major difference between the two types of carbs at play when we’re indulging in sweets or stocking up on energy. Simple carbs have no real redeeming qualities, break down quickly into your bloodstream, and can be found in baked goods, cereals, and foods with lots of sugar. Complex carbs take much longer to break down, providing you with a steady flow of energy and can be found in grains, fruits, vegetables, and dairy products. These calories are just another example of what we’ve been trained to fear. Common misperceptions about fats are that they clog our arteries, result in obesity, and are the cause of potential health issues down the road. There are bad fats and good fats. Good fats are found in nuts, avocados, fish, and natural oils. We require fats to maintain a healthy diet, and they provide more energy than protein or carbohydrates. Now that we know the essentials of sustenance that our bodies need to maintain energy and health outdoors, let’s explore some of the snack opportunities you can easily create at home or buy without breaking the bank. It may be difficult to eat as much as you burn, but you can pack a lot of tasty options for emergencies, pit stops, and camping breaks. Breakfast – Some healthy options for your most important meal of the day include oatmeal, granola, dried fruits, whole grain breads, chocolate, and other foods high in caloric density with a little bit of complex carbohydrates for that initial boost of energy you need to get the day started. Snacks – Peanut butter, nuts, seeds, and trail mix are all reliable snacks to hold you over until lunchtime. Nuts are packed with protein and unsaturated fats so your body can function the way it should. Snacking is crucial because our bodies can run out of fuel easily, especially in warmer weather. Keep your body from relying on the reserve tank of body fat by munching often. Lunch – Canned fish, such as tuna, is a popular choice because it’s tasty, ready-to-eat, contributes to cardiovascular health, and boosts the immune system. Pack a few mayonnaise packets to turn it into tuna salad straight out of the can. Snacks – Energy bars, chews, gels, and meat jerky are all excellent afternoon snacks to help boost energy between lunch and dinner. You can never go wrong with granola, and it helps regulate digestion in addition to preventing constipation for a smooth experience. 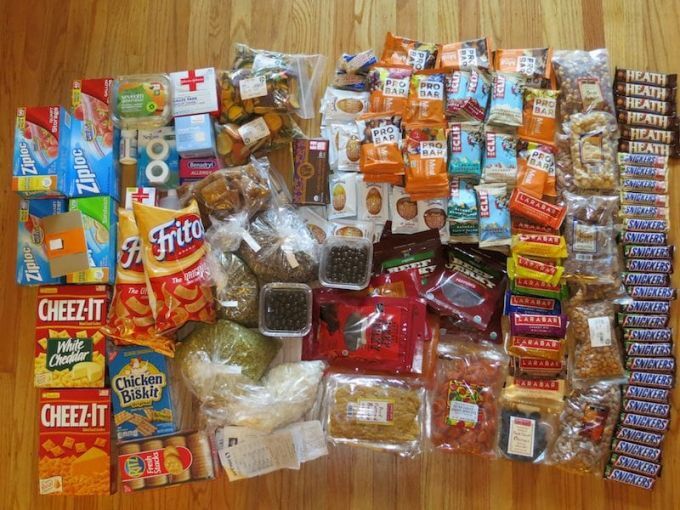 Dinner – Most experienced hikers and backpackers understand the importance of packing nonperishable food items that may only require boiling water to prepare. Dehydrate your favorite rice, couscous, whole-grain pasta, ramen noodles, and/or vegetables to create a gourmet supper under the starry sky or over a warm campfire. Soups are another portable option that won’t take up much space and take only minutes to prepare. Salty snack mixes, such as pretzels, crackers, or other foods that contain complex carbohydrates will help fuel the body and replenish any electrolytes lost through sweating. Fruits rich with potassium can combat any excess of sodium, but we’ll review why fruits shouldn’t be at the top of your list for your imminent backpacking trip. You likely thought fruits would be a shoe-in as a major hiking meal, but the problem with packing fruit is that it only supplies vitamins and minerals. Although fruits and other fresh foods are great for you, they don’t supply any of the essential nutrients you need for the intense level of exercise involved with hiking. We do, however, suggest dehydrating your favorite fruits into delicious chips for snacks between meals. Here are some of the most popular fruits to dehydrate: apples, raisins, bananas, dates, mango, and other choices high in potassium, iron, and essential vitamins. Adding a cooler to your gear can result in a heavy pack. Save the energy spent carrying too much weight by avoiding foods that need to be refrigerated. Last but not least, pack each meal individually to keep your rations organized and readily available. Many experienced hikers like to divvy up each day’s worth of meals and snacks within one bag. This approach will help you find ways of downsizing or optimizing your caloric requirements without sacrificing nutrition. Now that we know packing can be made more efficient by apportioning food by individual meals or entire days, you can avoid rummaging through your backpack to track down that half-eaten bag of granola from earlier. An important factor in preparing your gear to include food is understanding the territories you’ll be hiking in. Whether you’re in bear country or a large state park full of animals, protecting yourself and your companions depends on the precautions you take to secure your food and pack smartly. Metal food lockers and specialty bear canisters are the superior choices for hikers headed to Alaska, the Midwest, or other regions where Black or Grizzly bears are prominent. Bears can be very curious animals and it doesn’t take much for them to wander into a campsite after picking up an appealing scent. 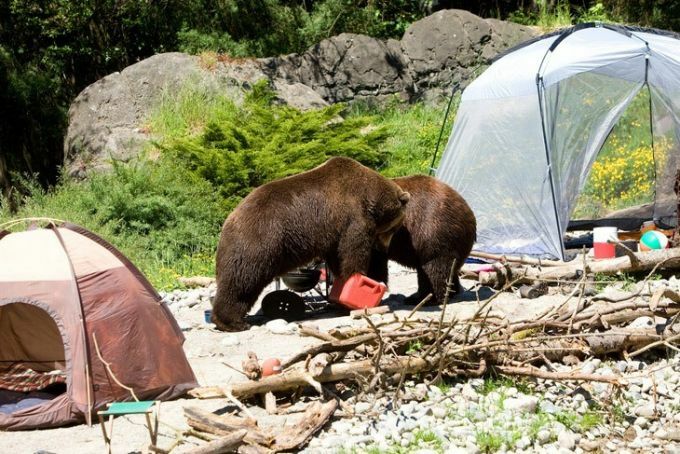 See our piece on how to keep wild animals away from your camp for more information. Make the responsible choice by never leaving food, trash, or scented products inside your tent, hammock, or sleeping bag. Between day-and night-foragers, it’s safe to assume you’re always being watched as the trespasser of a natural habitat. If bear canisters or lockers are too heavy for you to carry (averaging between two to three pounds), you can opt to hang your food above your campsite from a tree or a cable. Major outdoor gear manufacturers also offer bear bags made from durable polyethylene that bears cannot tear open. Hiking during the colder months is always a risk, and there’s a fine line between wanting to pack a little extra to keep your body functioning as it should and packing a little too much so that your body’s actually wasting precious energy when it needs it most. You should never pursue a winter hike without any prior experience, so we suggest attempting a short, two- or three-day hike to test your minimum nutritional requirements to better gauge how you can conserve on pack weight for optimum energy. Although we’ve heavily explored the rules of sustenance while exploring the backcountry, it would be irresponsible of us to avoid the topic of hydration. As we mentioned earlier, the human body can survive weeks without food, but no more than a few days without water. While it’s dangerous to assume any stream, river, or static body of water can provide the hydration your body needs, there are affordable and convenient solutions for filtering water to ensure that it is potable and free of contaminants. Educate yourself and your hiking companions on the necessity of boiling water or alternative methods for finding water outdoors. Since the dawn of our existence, humans have explored the countryside in search of fertile lands, water, and new homes without conflict. Only since the eighteenth century has hiking, as we now call it, become a popular pastime for nature enthusiasts and athletes. Check out our review of the top energy bars to keep nourished on the trail. Whether you’re just starting out or you’ve already climbed some major hiking trails, we hope that our exploration into popular and nutritious hiking snacks as well as safe practices for an improved experience will help you better prepare for your upcoming adventure and provide the best advice to any companions or family members joining you on this outdoor expedition. Remember to stay hydrated at all times and supplement your nutritional loss through exercise and perspiration by snacking on foods rich with protein, carbs, and fats throughout the day. For the top camping food you will need, see our article on this topic. Do you know of any other nutritious snacks to prepare or buy for hiking? Do you have any favorite recipes you’d care to share? If so, please let us know in the comments!